Available in chrome plated, polished aluminum, stealth black and Factory Cast PLUS+ finishes, Tuff Stuff has a complete line of alternator fans, pulleys and bullet nose fan and pulley kits. Tuff Stuff OEM style external voltage regulators feature solid state electronics for long life and dependability. Alternator charge wires feature heavy gauge multi-strand copper wire and are available in 24”, 36”, 48” or 60” lengths. These cables are ideal replacements for the thin factory charge wires especially when using a high amp alternator. 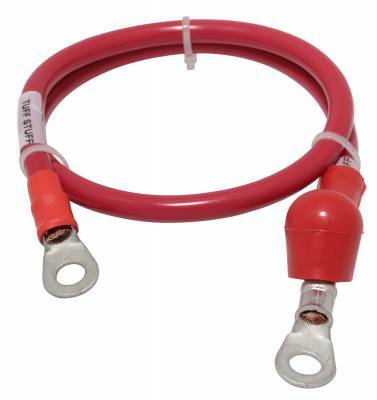 The oil and water-resistant plastic wire covering is bright red and features factory crimped 5/16” ID copper ring terminals on each cable end and a red alternator terminal cover. Description: Product Features 5 Groove Pulley Cast Steel Made In The U.S.A. Description: Product Features 6 Groove Pulley Cast Steel Made In The U.S.A. Description: Product Features 6 Groove Pulley Gold Zinc Made In The U.S.A. Description: Product Features Double Groove Pulley Cast Steel Made In The U.S.A. Description: Product Features Double Groove Pulley Gold Zinc Made In The U.S.A. Description: Product Features Single Groove Pulley Cast Steel Made In The U.S.A. Description: Product Features Single Groove Pulley Gold Zinc Made In The U.S.A. 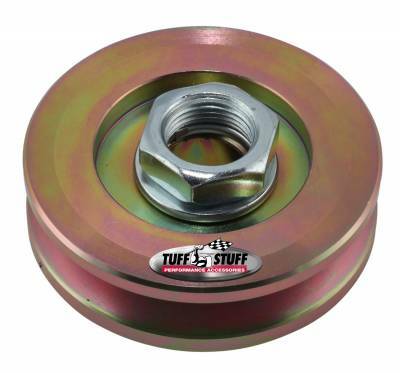 Description: Product Features 6 Groove Pulley Cast Steel Universal Fit Made In The U.S.A. Description: Product Features 7 Groove Pulley Cast Steel Made In The U.S.A. Description: Product Features 8 Groove Pulley Cast Steel Made In The U.S.A. Description: Product Features 5 Groove Pulley Gold Zinc Made In The U.S.A. Description: Product Features 7 Groove Pulley Gold Zinc Made In The U.S.A. Description: Product Features 8 Groove Pulley Gold Zinc Made In The U.S.A.